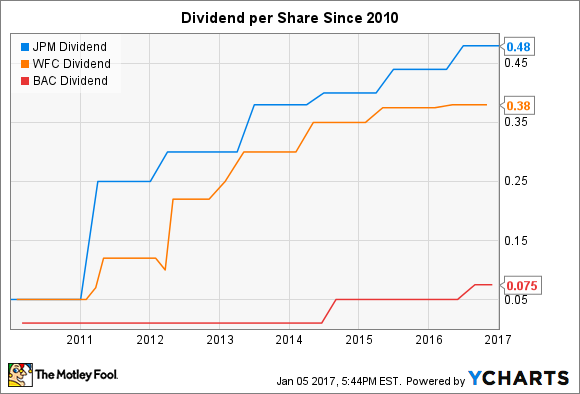 Will Bank of America Raise Its Dividend This Year? There’s a high likelihood that Bank of America will boost its quarterly payout in 2017. Nothing is for sure, but I believe it's safe for Bank of America (NYSE:BAC) shareholders to assume that the nation's second biggest bank by assets will raise its dividend in 2017, marking the second consecutive year in which it's done so. I say this with a high degree of confidence because it's essentially just echoing what Bank of America CEO Brian Moynihan has said since he took over in 2010. In one of his earliest interviews, in 2011, he told Fortune's Shawn Tully that his goal was to first build up the bank's capital levels after which he'd return most of the bank's earnings to shareholders. Moynihan has now accomplished that first objective. As I detailed at the end of last year, Bank of America has more capital than any other big bank. It has $270 billion worth of shareholders' equity compared to JPMorgan Chase's (NYSE:JPM) $254 billion. Citigroup and Wells Fargo (NYSE:WFC) round out the four biggest banks by capital, at $232 billion and $203 billion, respectively. The fact that Bank of America has an abundance of capital is also clear when you look at its regulatory capital ratios. To be considered well-capitalized from the perspective of regulators, Bank of America needs to maintain a 5.875% common equity tier 1 capital ratio. That equates to roughly $90 billion worth of common equity tier 1 capital, or about $80 billion less than Bank of America had at the end of the third quarter. On top of this, one reason Bank of America has so much capital is because its requests to increase its dividend over the past eight years have either been denied by the Federal Reserve, which has veto power over big bank dividend plans, or because it hasn't requested permission in the first place for fear that it would be denied. This is in contrast to JPMorgan Chase and Wells Fargo, the North Carolina-based bank's closest competitors, both of which have increased their dividends annually since 2011. The net result is that Bank of America's payout ratio, the share of earnings distributed via dividends, is only 17%. That's half as much as JPMorgan Chase and Wells Fargo, which pay out between 30% and 40% of their earnings. For us as a company, just because of where we are, it's about capital return.... It's about getting certainly around the ability to have access to your capital return once you've met all the hurdles. And whether those hurdles move up or down because of various peoples' points of view, the issue is the industry's above them, and now we need to be able to get the capital out. But even if these changes don't come about in 2017, it still seems to me like Bank of America will raise its dividend this year. Unless something bad and unexpected happens at the bank between now and this year's stress tests, the Fed just won't have a credible reason to deny its expected request to return more of its abundant capital to shareholders.